On May 22, 2011, Jakarta set a new milestone towards a healthier and more livable city. The Jakarta administration inaugurated the first Jakarta’s dedicated bicycle lane stretching 1.5 kilometers from Ayodia Park to Blok M in South Jakarta. Jakarta is late in promoting bicycle lanes. Jakarta has focused in promoting the use of cars by building more elevated inner city toll roads and ignored the importance of non-motorist trips in the city. Jakarta's Traffic This Morning, originally uploaded by Chandra Marsono. Many metropolitans in the world have developed dedicated bicycles lanes for years. Cities in developed countries, particularly in Europe, have integrated bicycle lanes into their transportation network systems. 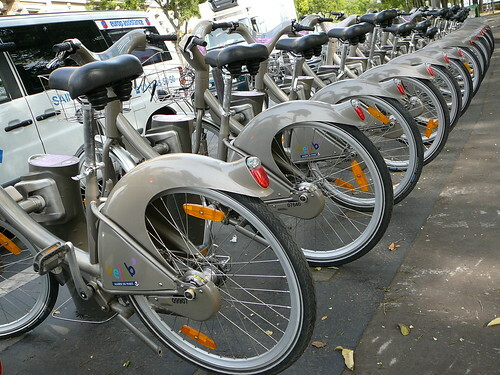 Those cities such as Amsterdam, Paris, Berlin, Copenhagen and Barcelona have been developed as bike-friendly cities. Safe and extensive bike route networks, promotion of pro-cyclist policies, and a bike culture have taken places in those cities. Cyclists in those cities are not second class residents and can safely ride their bicycles as the main mode for their daily commute to their workplaces. 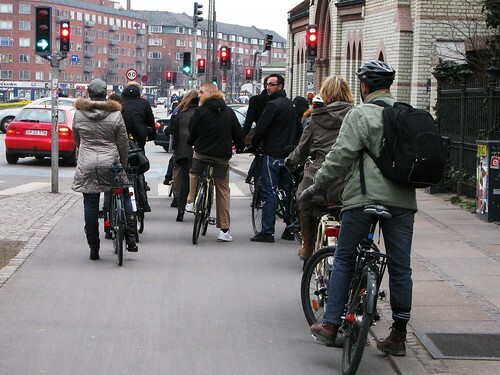 Copenhagen is an example of European bike-friendly city where about a third of workforce in this city commute to the office by bike. The inauguration of the first Jakarta’s dedicated bike lane stretching from Ayodia Park to Blok M should also be considered as a breakthrough in solutions for acute traffic congestions in Jakarta. The development of dedicated bicycle lanes is a good move from the Jakarta administration for promoting the use of bicycle as an alternative transportation mode. If the Jakarta city administration could encourage more motorists to shift to using bicycle to work, the city’s chronic traffic woes could be eventually reduced. Bike Lane and Traffic Lights, originally uploaded by Mikael Colville-Andersen. Some Copenhageners on their way home in the afternoon, along the busiest boulevard in the capital, Hans Christian Andersen's Boulevard. Over 20,000 bikes a day on this stretch and this intersection is among the busiest in the kingdom. Notice the abundance of traffic lights, for extra safety. Cyclists here have three lights to look at. Helpful if you're stuck at the back of a queue of 50-75 bikes. You'll always be able to see one. The first dedicated bike lane in Jakarta is only a small step in developing Jakarta as a bike-friendly city. There are many challenges for Jakarta to be a bike-friendly city. The Jakarta city administration needs to have a strong commitment to build more dedicated bike lanes and integrate them with the city transportation network system. Dedicated bike lanes should be part of the city transportation network system and designed to accommodate the need of residents’ mobility in the city. It is very essential to connect dedicated bike lanes with mass transportations including the Mass Rapid Transit (MRT). It’s not easy to build more dedicated bike lanes if the Jakarta city administration still focuses on building more elevated inner-city toll roads as the solution of addressing the chronic traffic woes in Jakarta. It is also important to note that the first dedicated bike lane was not initiated by the Jakarta city administration but the Indonesian Bicycle Community (Komite Sepeda Indonesia) that donated as much as 500 million rupiahs to build the bike lane. 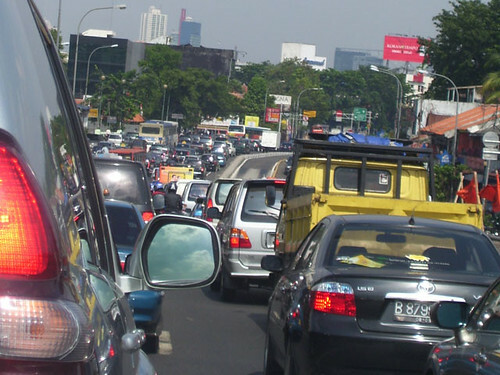 The Jakarta city administration needs to change the mindset of the possible solution for the chronic traffic congestion in the city. The solution is not building more roads, but reducing the use of cars through improving and expanding the use of mass transportations and bicycles. Another big challenge for bike lanes in Jakarta is the lack of law enforcement. The Jakarta city administration should strictly enforce the dedicated bike lanes for cyclists. The dedicated bike lane cannot be used as parking spots and a lane for motorcyclists. A few days after the inauguration of the bike lane stretching from Ayodia Park to Blok M, the lane was overwhelmed by private cars, pubic minivans and three-wheeled vehicles bajaj. A number of private cars were also parking in the lane (The Jakarta Post, 27 May 2011). Without strict law enforcement, the dedicated bike lane will not be an effective way to reduce the Jakarta’s traffic woes and will only be a failed initiative. Velib' bikes, Paris, originally uploaded by the noggin_nogged. Despite the challenges for bike lanes in Jakarta, the inauguration of the Jakarta’s first bike lane should be seen as a promising way of alleviating the acute traffic problems in Jakarta. I hope that the inauguration of the Jakarta’s first bike lane could be the milestone for the Jakarta city administration in changing the mindset of how to address the chronic traffic problems in Jakarta. It is not building more toll roads but reducing the use of cars through encouraging more motorists to shift to cyclists or mass transportation riders. i am in line with you about the solutions of Jakarta's congestion. Government should urgently think over other alternatives beside relying upon only a solution, i mean through BRT. how to reduce a usage of motor and car will be a wise statement than to create other roads or widen existing roads. developing bicycle lane and integrating it to transportation network will be a great solution and absolutely, it will create other benefits, create healthier and more sustainable city. Im so glad that the biking revolution is on the rise in Jakarta, ive lived here for a year now and its exciting to see it growing.. But more needs to be done than just interest groups like Bike to Work, the govt needs to be lobbied at a higher level.. Biking can help reduce Jakartas massive traffic and pollution problems, the revolution starts with us. Great to read that Jakarta is trying to get biking inaugurated. I was in Jakarta twice this summer and it was hard to experience the overwhelming crowds of traffic and pollution. As stubborn Dutchies we went through the city on foot, but even if there was a pedestrian path the motorcyclists kept annoying us. The Monas square is the only place where it felt easy to walk or cycle. After this experience I can imagine that people use this bike lane in the wrong way. There has got to be a big change in traffic culture before bike lanes will succeed here. Your blog got my curiosity do you have pictures of this bike lane? And what is the government's plan to stimulate biking? Interesting topic! I think Jakarta can certainly do the same and I see there are some new developments where this can work, but it is still limited. A freind of mine the President of the Bicycle Association has been heavily promoting bicycling and even took the President on a bike ride. Hopefully this will further set the direction. Keep up the ideas to stimulate thinking, in Indonesia, hope your message is getting across.